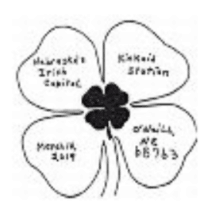 There is a Four Leaf Clover for O’Neil, NE is how I’m describing the 2019 Holt County Historical Society Pictorial Postmark. 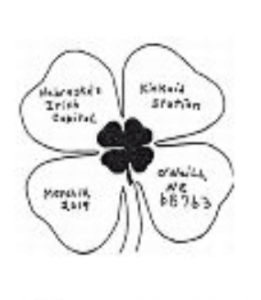 In the latest USPS Postal Bulletin that just came out on Thursday the only St. Patrick’s themed one I’m seeing is the 2019 Holt County Historical Society Pictorial Postmark, details below. 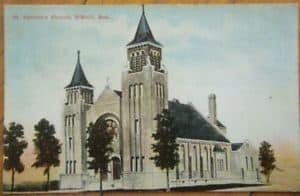 First, I’m including a mention of this 1910 Postcard St. Patrick’s Church-O’Neill, Nebraska NE for sale at eBay. The listing price is at $9.99 and this is the link. Here is the address for requesting. For full details on how to send off for them at the USPS Postal Bulletin 22515. In conclusion, – remember, if you find yourself staring a stack of ‘meant to send these St. Patrick’s Day cards’ off – then send via requesting the pictorial postmark. It is a nice touch to add to our letter writing – and it will look deliberate and you took the extra time to have the four leaf clover too! See you tomorrow as we kick off a new week! P.S. The AnchoredScraps daily blog post countdown to 1500 continues with today being #1481!.